The weather is fine, the heat comes back and quite naturally, as every year when spring finally arrives, your cat loses its hair abundantly. Nothing as quite normal as this, you may say. But for your clothes, carpets and sofas, as for the health of your companion on four legs, you’d better try to minimize the effects of such a natural phenomenon , even though an over control of it would sound out of hand ! This will not have escaped you, the cats spend a great time toileting. They then ingest dead hair that accumulates in their stomach and can create balls of hair that disrupt the proper functioning of their digestive system. Anorexia, vomiting and constipation are all signs that should alert you. 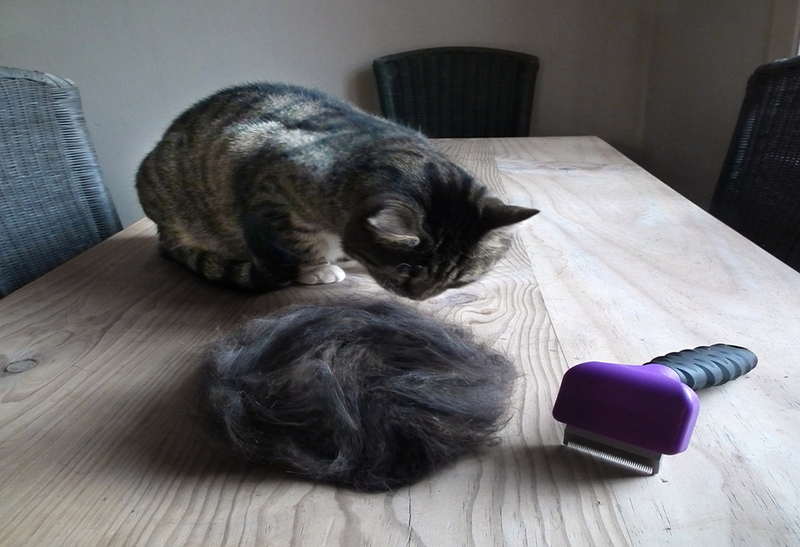 To avoid the formation of these hairballs and limit the amount of dead hair prevalent in your interior, your best friend of course is the brush. If your cat has long or medium hair, it is strongly advised to brush it every day during molting, and every two days for the rest of the time. A short-haired cat brushed once or twice a week in normal weather should also be more regularly in the spring and fall. There are more fiber-rich cat recipes that facilitate the elimination of hairballs. Do not hesitate to talk to your veterinarian if your cat is often subject to this problem. At the moment of molting, you can also add a little liquid paraffin from time to time to the cat’s food. Think of catnip, known to help cats purge themselves. Renowned for its effectiveness for humans, brewer's yeast is also strongly recommended to maintain the coat of animals. You can find them in the form of chewable treats. In addition to reducing hair loss, brewer's yeast will make the coat of your feline even softer. In addition to the indispensable vacuum cleaner - some models are even designed to extract the hair of pets - the happy owners of cats also have an interest in being equipped with fabric brushes, self-adhesive or velvet, which will render them comfortable and well served. A wet washcloth, a dust cloth or a pair of spun pantyhose are also very effective in fighting the most resistant bristles!